Glycoflex III Bite-Sized Chews are part of a program that combats joint deterioration in geriatric and working dogs. It will give your dog relief from pain associated with arthritis. Glycoflex III SoftChews can be used in all breeds of dogs. Rated 4.5 out of 5 by 24 reviewers. I saw results in my lab after a week of giving them to her. The product is ok for larger dogs. My old Boxer is a New Dog! 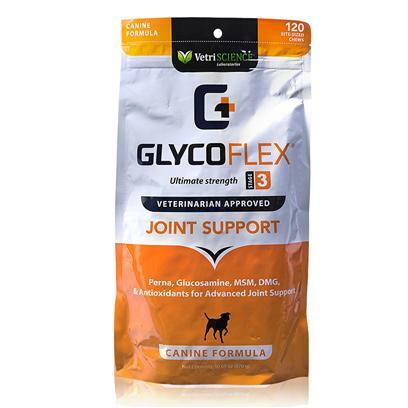 Glyco-flex III saves life of 14 yr. old dog; "Mr. Bum"!